Eggplant or Aubergine as it’s known in the UK is a glossy, deep purple coloured fruit that is meaty, versatile and belongs to the nightshade family of vegetables. So, with that warning in mind can dogs eat Eggplant? Is it safe to share aubergine with our furry friends? Eggplant is a good source of dietary fibre, Vitamin B1 and copper. Not only that but it also contains good levels of manganese, Vitamin B6, potassium and folate. Not to mention it’s also a source of phytonutrients such as nasunin a potent antioxidant that protects the lipids (fats) in brain cell membranes from free radicals. What’s more, it also boasts antioxidant phenolics. Phenols offer powerful protection from free radicals which can aid in cancer prevention and heart disease. 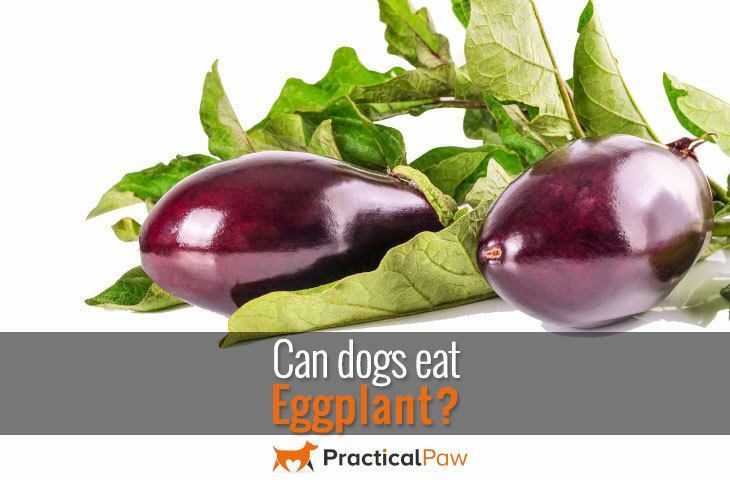 Fed in moderation eggplant can add an interesting element to your dog’s diet. But care is needed as the nightshade family is a common allergen. If your dog has never had eggplant before, keep a close eye for any of the following symptoms that will usually appear within an hour. Although most minor reactions will pass by themselves, it’s worth contacting your veterinarian if you are worried or the symptoms seem severe. Unfortunately, some dogs may experience such an extreme reaction that they need antihistamine treatment and your vet can provide immediate relief via injection. If your dog has a history of allergies, it’s best to stay away from offering any foods from the nightshade family just to be on the safe side. However, if you do want to share some eggplant with your dog, it’s much more palatable cooked. The raw fruit has a somewhat bitter taste that disappears once cooked. Aubergine can absorb a huge amount of fat, oil or sauce. So it’s worth taking this into account if you haven’t cooked the eggplant yourself before you give any to your dog. Excess fat and flavourings such as onion can be harmful to your dog’s health, so it’s better to err on the side of caution and only give your dog plain, cooked eggplant. Despite the possible issues of additional seasonings, aubergine is such a versatile vegetable that it can be roasted, mashed, slow cooked, boiled or grilled to bring out its natural complex flavours. Adding a small amount of eggplant to your dog’s food isn’t going to cause an issue unless your dog is sensitive to it, but there are alternative vegetables that are safer and have a good nutritional profile, like sweet potato. While the fruit of the eggplant carries a small risk of causing an allergic reaction, the stems, leaves and flowers need a bit more caution. The green parts of all nightshade plants contain a toxin called Solanine (Glycoalkaloid Poison) which if eaten in large enough quantities can cause vomiting, diarrhoea, weakness and confusion. So if you are a fan of homegrown produce and your dog keeps you company when harvesting your crops keep your dog safe and away from all nightshade greenery. The answer is yes, but in moderation. Plain, cooked eggplant is fine to give your dog if they don’t experience any adverse side effects. Adding fruit and veg to your dog’s meals can boost the vitamin and mineral content of their diet as well as increase interest in food if your dog is a picky eater. Having said that there are plenty of other fruits and vegetables that have little or no known allergens associated with them and may be a better choice if your dog is sensitive.